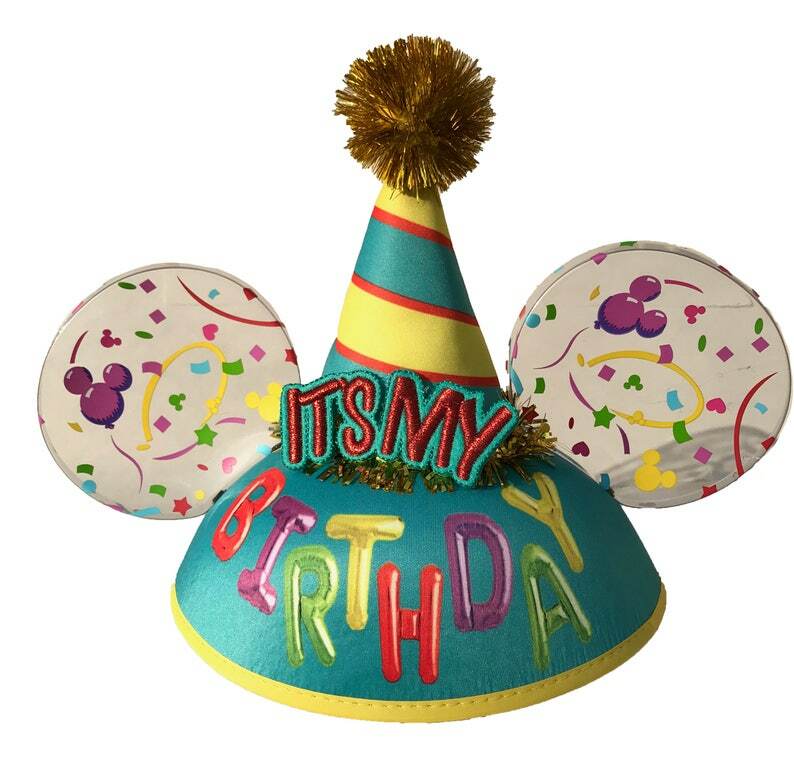 This colorful birthday ear hat is decorated with both printed and embroidered graphics, a stuffed fabric birthday cone and golden fringe. The clear plastic ears are printed with an all-over balloon and confetti pattern. These are authentic Ear Hats direct from the Disney Parks. We customize the back of each Ear Hat with a name or phrase of your choosing, using our own professional embroidery machines. The sample in the photo is personalized in the Walt font with red thread; you will choose your preferred font and thread color at checkout. This hat can be embroidered with up to two lines of text. For best results, we recommend that you limit personalization to 10 characters and spaces per line. Longer names can be embroidered, but the font gets increasingly small with each additional letter. We will customize your design to fit your selected text. If we have any concerns about the way your chosen font looks with your name, we will send you a digital proof to approve before we embroider the hat. We receive a lot of questions about the sizing of ear hats. This style is marked as "Youth," with a 54cm diameter. Ear hats do not fit like baseball caps, but rather sit on the head like a beret or skullcap. This hat will be small on most adults, may touch the ears of youth depending on head size, and will touch or cover the ears of toddlers and infants. The attached chin strap will keep the hat comfortably on a youth, but you may wish to instead secure the hat with bobby pins or snap barrettes for added stability on adults or infants.